Is your SEO investment really paying off? To understand how your SEO campaigns are doing, you’ll need to measure the success of your SEO. In this article, we’ll show you how to measure SEO performance with Google Analytics. Before we dive in, it’s worth taking a moment to ensure that you have all the right set of Search data in your Analytics account that helps you analyze your existing SEO campaigns and refine them for good. 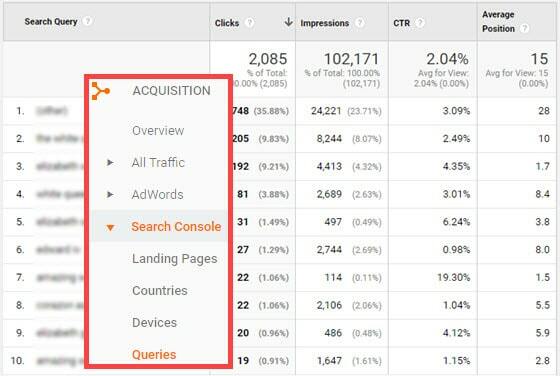 To get most out of your Analytics account for SEO analysis, you’ll need to connect it to your Search Console account. Without a doubt, Google Analytics is the best tracking tool out there that lets you see how your website is doing when it comes to driving traffic. While it gives you a basic overview of traffic sources report, including organic traffic, you’ll need to connect your Analytics account with your Google Search Console account for more detailed insights. To find how your site performs in Google Search, you can go to Acquisition » Search Console » Landing Pages. Under the Search Console section, you can also find other reports including Queries, Countries and Devices. Now that you’ve imported your Search Console data into your Google Analytics, you can start analyzing how your site performs in Google Search. Chances are you used to regularly monitor your Google Analytics data once in a while, but it’s always better to create an alert that notifies you when there is a significant change in your search traffic. For instance, if your site got impacted by a recent algorithm update, the alert will notify you about it so that you can take specific measures to reverse the action as early as possible. Basically, creating an alert ensures that you don’t miss any important changes on your site unnoticed. 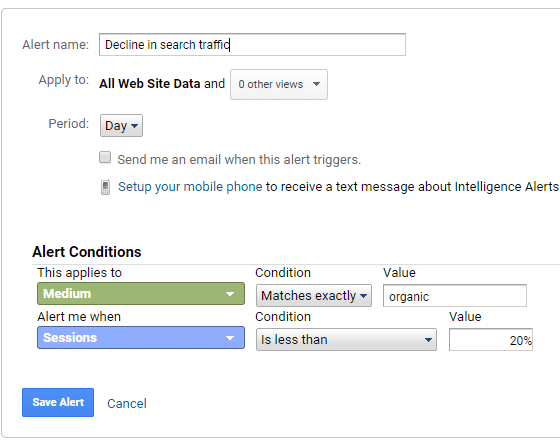 Follow the steps below to set up a custom alert in Analytics that alert you to take action if there is a significant change in your Analytics report. Click Admin in the left taskbar. 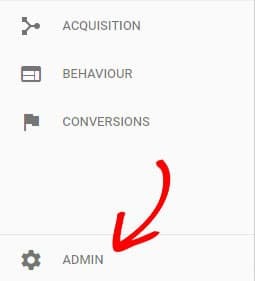 Click Custom Alerts in the View column. Then configure the settings just like the screenshot below, and click Save Alert. Now that you’ve imported Search Console data into your Analytics account and set up a custom alert to ensure that you don’t miss any changes unnoticed, it’s time to start measuring your SEO Performance. 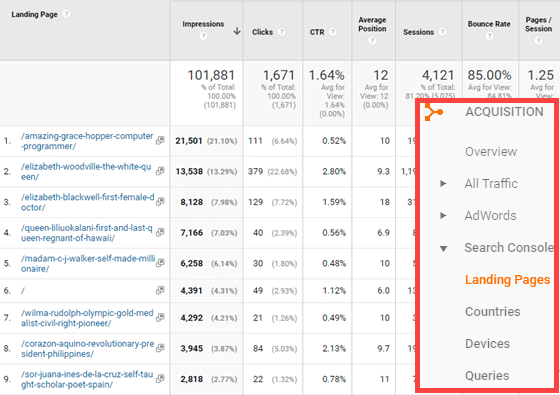 Let’s take a look at a few Google Analytics reports and discover how to interpret the data. If you want to track the SEO performance at a per page level, you can navigate to Behavior » Site Content » All Pages. You’ll now find the All Pages report that provides you with a compilation of pageviews for all pages from all traffic sources. To sort the pageviews by traffic medium, you’ll have to add medium as your secondary dimension. Now let’s filter the data to show only pageviews from organic traffic. To do this, click on Advanced and specify organic in the field next to the Containing dropdown. You can also click on any of your top performing pages in the report to see your page-specific performance and then add medium as secondary dimension. You can now compare your organic traffic with other traffic sources by using the Plot Row feature. Select all results and click Plot rows below the table. This way, you can easily identify how your organic traffic contributes to your overall traffic. Want to get insights into how users search on Google to find your pages and the relevancy of your pages to those queries? 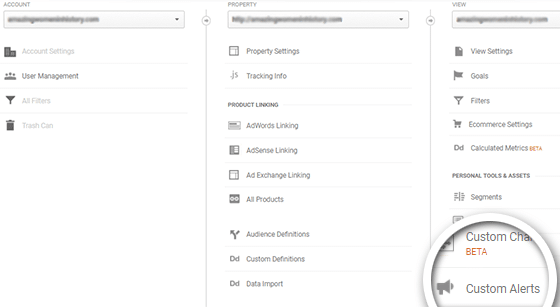 Then, you need to look at the search queries report by navigating to Acquisition » Search Console » Queries. 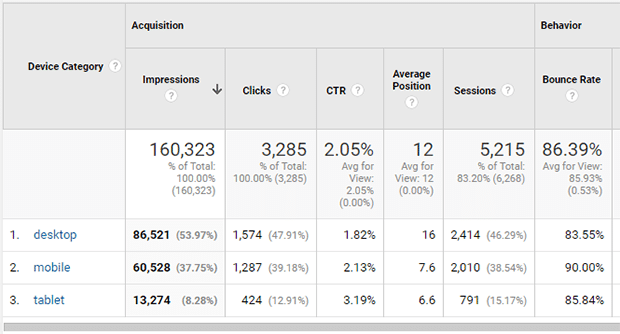 In this report, you can find useful metrics like clicks, impressions, CTR and average position. In addition to reviewing search queries, you’ll also need to understand keyword intent to analyze whether you’re attracting the right traffic to your site. See OptinMonster’s guide on how to choose the right keywords for advice on discovering intent. Bounce rate is one of the most undervalued metrics of a successful SEO campaign. It is the percentage of visitors who leave your site after just viewing one page. While Google doesn’t take the bounce rate shown in your Analytics into account as a ranking factor, it does look at how quickly a visitor bounces off a page by hitting the back button and return to the search results page. When a visitor doesn’t engage with your content and bounces quickly, it is typically because your page isn’t satisfying their query. If a lot of users leave your web pages quickly upon landing, it may affect your page’s search ranking in the long run. To find the bounce rate of your landing pages, you can navigate to Acquisition » Search Console » Landing Pages. The Devices report in your Analytics gives you detailed insights into how well your site performs for users on different types of devices. Since mobile friendliness is an important ranking factor, cross-platform optimization of your site is essential. 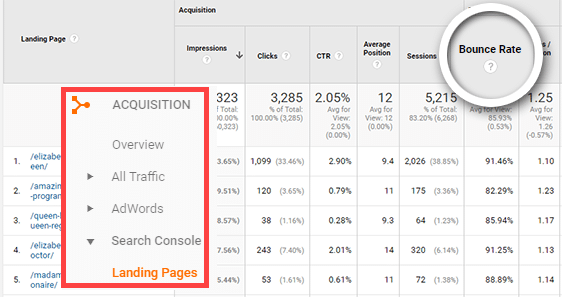 To find the report, you can go to Acquisition » Search Console » Devices. For instance, in the above screenshot, you can find that the CTRs of mobiles and tablets are high. This means people are more likely to click on your pages from the search results if they’re on a mobile device. This clearly shows that your mobile strategy is paying off. You can also see that the bounce rate is high for mobile, so you might want to check if there is room for optimizing your content for mobile visitors. Next to mobile friendliness, site speed is another important ranking factor you need to focus on. 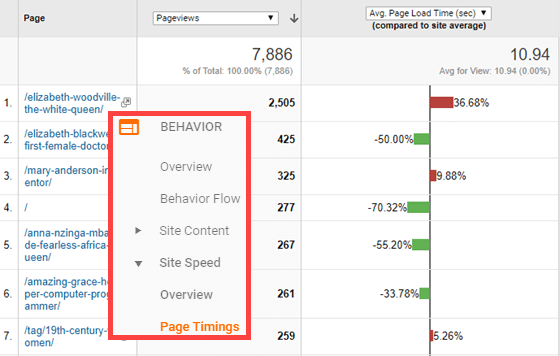 You can navigate to Behavior » Site Speed » Page Timings to get a quick overview of pages that are slow, which needs to be optimized. You can learn how to speed up your site for better performance. Now you know how to measure SEO performance, interpret the Analytics data and ultimately refine your SEO campaigns for best results. If you enjoyed this article, you might also find some of our SEO guides helpful. Don’t forget to follow us on Twitter and Facebook for more Google Analytics tutorials. Thank you so much for sharing important content. Keep posting like this.